Tallgrass Prairie National Preserve is a United States National Preserve located in the Flint Hills region of Kansas, north of Strong City. The preserve protects a nationally significant example of the once vast tallgrass prairie ecosystem. Of the 400,000 square miles (1,000,000 km2) of tallgrass prairie that once covered the North American continent, less than 4% remains, primarily in the Flint Hills.Tallgrass Prairie National Preserve is a new kind of national park. The preserve is 10,894 acres (44 km2), but most of that land will remain under the ownership of the The Nature Conservancy, which purchased the land in 2005. The National Park Service may own up to 180 acres (0.7 km2), yet the legislation calls for the entire area to be managed cooperatively by the National Park Service and the The Nature Conservancy. On September 20, 2002, approximately 32 acres (129,000 m2) were donated to the National Park Service from the National Park Trust who was the private landowner at the time. This area includes the 1881 historic ranch house, limestone barn and outbuildings, and one-room schoolhouse.Tallgrass Prairie is the nation's second newest national preserve and the park is still under development with visitor opportunities continually being expanded.There are currently five maintained hiking trails in the preserve allowing visitors access to the tallgrass prairie. During the summer, narrated bus tours of the prairie are offered.On January 29, 2008, Tallgrass Prairie National Preserve was named as one of the 8 Wonders of Kansas.In 2009, The Nature Conservancy introduced a small herd of bison into the Tallgrass Prairie National Preserve. Here's the our members favorite photos of "National Parks in Kansas". 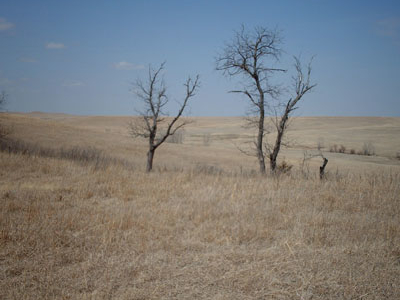 Upload your photo of Tallgrass Prairie National Reserve!